THE MANGA Sickness unto Death picks up thoughts from the Danish theologian and philosopher Søren Kierkegaard from the 1800’s. In this psychological tragedy an aspiring psychology student tries to therapize his seriously ill landlady. The story begins by showing professor of psychology, Kazuma Futaba. He takes flowers to a remote tomb. Then he starts to look back on his first patient case, which was also the greatest love of his life. 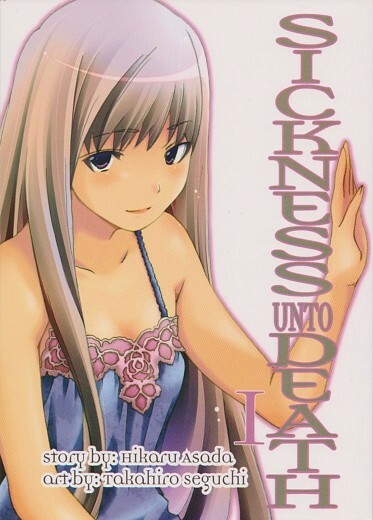 Sickness unto Death (死に至る病, Shi ni itaru yamai) is written by Hikaru Asada and illustrated by Takahiro Seguchi. It was first released in Japan by Hakusensha in Young Animal magazine in 2009-2010. The story was also published as two paperbacks in 2010. Vertical has now released the first paperback book in English. The translator’s name is not mentioned. The manga is recommended for older teens, 16 years and over. When young Futaba Kazuma arrives in the city to study psychology, his first encounter is with a hopeless Emiru Ariga, who is crying in panic on the street. He stops to help the young lady. 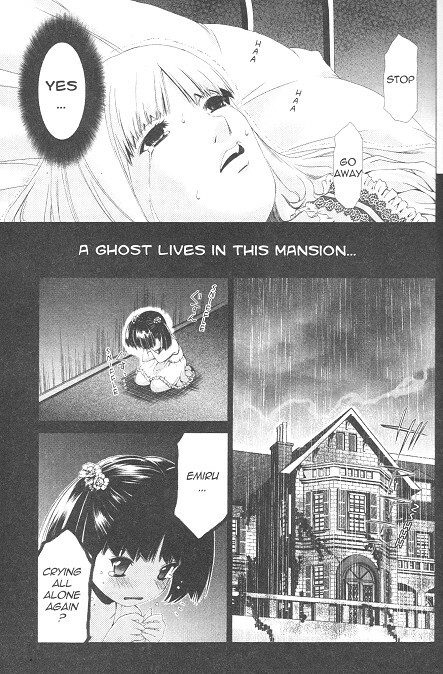 A little later it is revealed that Emiru hosts a big empty mansion where Kazuma is supposed to rent a room. He has been told in advance that he will sometimes have to help a sick landlady. Emiru is now 18 years old. Her parents died when she was four. She lives in the Ariga family-mansion alone with an elderly butler called Kuramoto. She is pale and weak, her pulse is slow as well as her blood pressure and body temperature. Due to illness she has stopped studying. 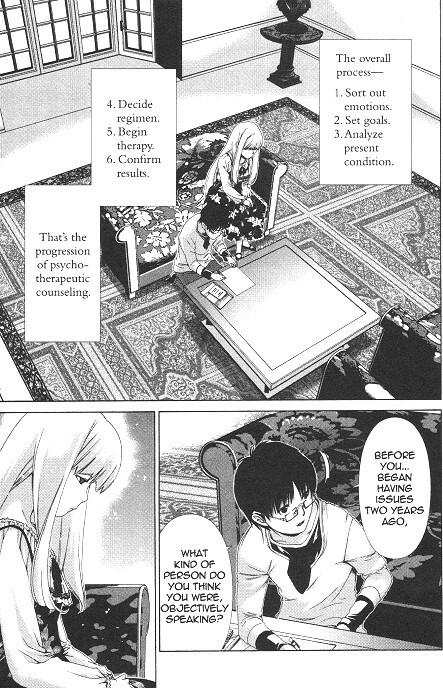 Kuramoto tells Kazuma that Emiru’s nightmarish symptoms are psychosomatic. Physical symptoms of anxiety and panic are produced by a fatal sickness called despair. Emiru displays great confidence in Kazuma. Despite his meager experience Kazuma has to try to find the reason for her despair. Young Emiru is haunted by ghosts from the childhood. THE CONCEPT of despair, and the name of the manga, come from the Danish Søren Kierkegaard’s (1813-1855) religio-psychological work Sickness unto Death (Sygdommen til døden) published in 1849. The long subtitle of the work is En christelig psychologisk Udvikling til opbyggelse og opvækkelse Af Anti-Climacus. Kierkegaard thought that human despair is caused by a distorted relationship with God. Man is consciously or unconsciously desperate, if he wants to live a self-dependent life, not relying on faith. A man’s self-realization requires, in addition to faith, a willingness to be one’s own self. In Sickness unto Death the protagonist Anti-Climacus sinks deeper and deeper into despair, where he eventually defies God. Kierkegaard’s Sickness unto Death can definitely not be regarded as a textbook of modern psychology or psychotherapy. However, I eagerly expect to see, how deep the manga progresses into the terms of Kierkegaard’s philosophy, and how seriously the philosopher’s christian ideas will be taken. In the first paperback, the young protagonist just starts to read Sickness unto Death, which he has received from the teacher of his psychotherapy lessions. By the way, the history of European philosophy is also touched in Shuzo Oshimi’s manga The Flowers of Evil. It is based on Charles Baudelaire’s collection of poems. The French poet Baudelaire (1821-1867) was a contemporary of Kierkegaard. He discussed the horrors of being human from a different perspective than Kierkegaard. Kazuma makes therapy with practically no experience. IT IS practically impossible to think a real life psychologist or psychiatrist would try to give therapy relying on Kierkegaard’s ideas. Thus, the manga is not based on reality. But if you can accept this much of unreality, the story is very interesting. Maybe it is even a good idea to discuss severe mental problems by taking some distance. Until two years ago Emiru was a happy and lively student. Then she suddenly started to wither away. Nightmares from childhood torture her, and she does not want to take any more. Despair occurs when she sees scarier things than death, and death itself becomes a relief. Takahiro Seguchi’s drawings superbly illustrate the the beauty and fragileness of Emiru. Kazuma makes all the mistakes that an aspiring therapist can do. Like quoting Søren Kierkegaard would not suffice, he will even start to therapize Emiru even though his only knowledge of psychotherapy comes from reading one textbook. Naturally happens what never should happen: the therapist and the patient fall in love with each other. With a young man trying to save his beloved, we are truly far away from professional therapy. In spite of his clumsiness, Kazuma little by little peels into the despair and mystery locked inside Emiru’s mind. The first part already reveals, that the core of the problem is Emiru’s relationship with his late father. Maybe there is something similar to what is found in Mitsuru Hattori’s manga Sankarea, maybe something else. In any case, I look forward to reading the second part.